Applications are available. Completed applications are due no later than 3pm on Monday, April 23. Students may apply if they will graduate from high school in the spring and have plans to pursue post-secondary education. Application forms are available at 1stlu.org/scholarship or in the church office during office hours, M-F 8am-4pm. Thursday, April 26, 11am–7pm, at NEW LOCATION: Onalaska America Legion, 731 Sand Lake Rd. This is an awesome fundraiser with delicious food! Didn’t get a ticket? You can still purchase a meal at the door, while they last. To volunteer your time and/or your baking skills by donating baked goods for youth to sell at the chicken dinner, go to 1stlu.org/chixdin. Questions? Contact jared@firstlu.org. It’s a relaxing way to volunteer! 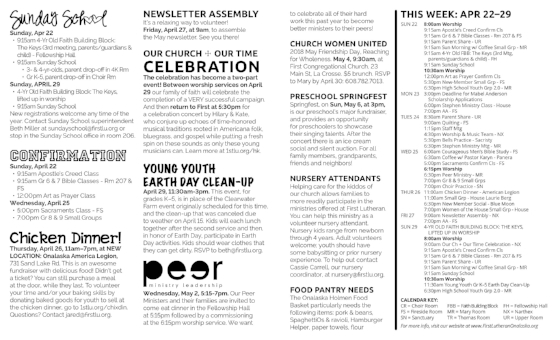 Friday, April 27, at 9am, to assemble the May newsletter. See you there! The celebration has become a two-part event! Between worship services on April 29 our family of faith will celebrate the completion of a VERY successful campaign. And then return to First at 5:30pm for a celebration concert by Hilary & Kate, who conjure up echoes of time-honored musical traditions rooted in Americana folk, bluegrass, and gospel while putting a fresh spin on these sounds as only these young musicians can. Learn more at 1stlu.org/hk. April 29, 11:30am-3pm. This event, for grades K–5, is in place of the Clearwater Farm event originally scheduled for this time, and the clean-up that was canceled due to weather on April 15. Kids will each lunch together after the second service and then, in honor of Earth Day, participate in Earth Day activities. Kids should wear clothes that they can get dirty. RSVP to beth@firstlu.org. Wednesday, May 2, 5:15-7pm. Our Peer Ministers and their families are invited to come eat dinner in the Fellowship Hall at 5:15pm followed by a commissioning at the 6:15pm worship service. We want to celebrate all of their hard work this past year to become better ministers to their peers! 2018 May Friendship Day, Reaching for Wholeness. May 4, 9:30am, at First Congregational Church, 23 Main St, La Crosse. $5 brunch. RSVP to Mary by April 30: 608.782.7013. Springfest, on Sun, May 6, at 3pm, is our preschool’s major fundraiser, and provides an opportunity for preschoolers to showcase their singing talents. After the concert there is an ice cream social and silent auction. For all family members, grandparents, friends and neighbors! Helping care for the kiddos of our church allows families to more readily participate in the ministries offered at First Lutheran. You can help this ministry as a volunteer nursery attendant. Nursery kids range from newborn through 4 years. Adult volunteers welcome; youth should have some babysitting or prior nursery experience. To help out contact Cassie Carrell, our nursery coordinator, at nursery@firstlu.org. Are you ready for spring cleaning and finding a new home for outgrown coats? Consider dropping off your gently-used, clean coats for the First Teen Clothes Closet and Children’s Closet. Other items on our most-needed list currently: toiletries (full-size toothpaste, body wash, shampoo, conditioner), wallets, and purses.